When it comes to giving gifts, I have to admit that I love it - it's one of my love languages. So when Carolina Premium Outlets reached out about putting together a holiday gift guide, I jumped at the chance! With so many shops to choose from, CPO is the ideal spot to check multiple friends and family off your holiday shop-for lists! Buy him what he needs. I don't know about you, but my husband can be incredibly difficult to buy for. But only because what he says he wants, are items he needs (work shirts, underwear, car floor mats - yes for real) And even though those items don't seem fun and maybe a bit boring, it's what he really needs, so he loves receiving them. Don't try to go too off the list. Check out all the printed button down options from Banana Republic Factory! My husband wears these to work everyday and at these prices, I can stock up and save! 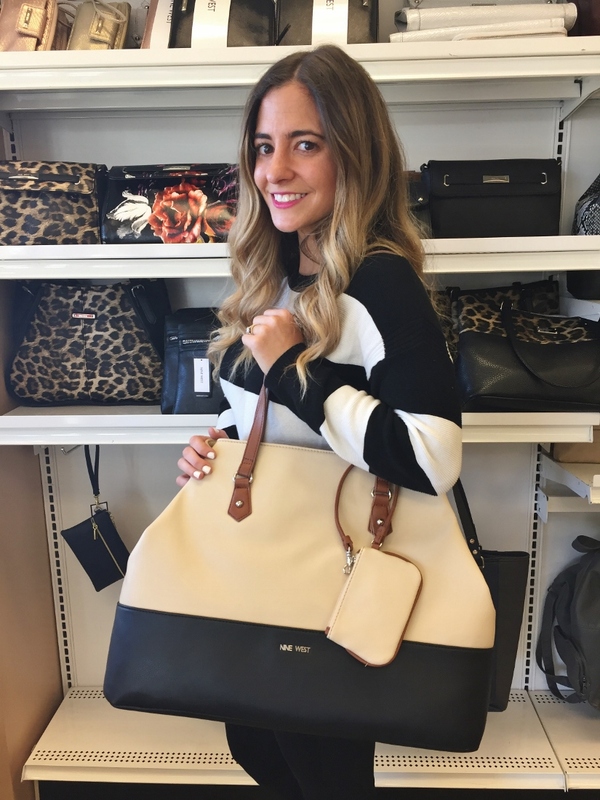 Sometimes, a great bag is the perfect gift for a gal pal. It could be something she needs, but doesn't always buy for herself. Enter Nine West Outlet!! I spotted this large carry all bag and had to grab it. I have a friend who's always traveling (both by plane and car) and it's the perfect size for her trips. But it also can double as an everyday work bag, roomy enough for computers, papers and anything else she might need. Plus, it was a fabulous price! This may be a little bit more exciting for the adults, but why not take a break from the toys. Is it just me or are the kids clothes like ridiculously cute these days? I mean.. I want some of them! And if you don't think your little one wants to open clothes, you can definitely shop for Christmas Day or New Year's Eve outfits early at Carolina Premium Outlets. I mean how adorbs are these 2 outfits from GAP Factory? 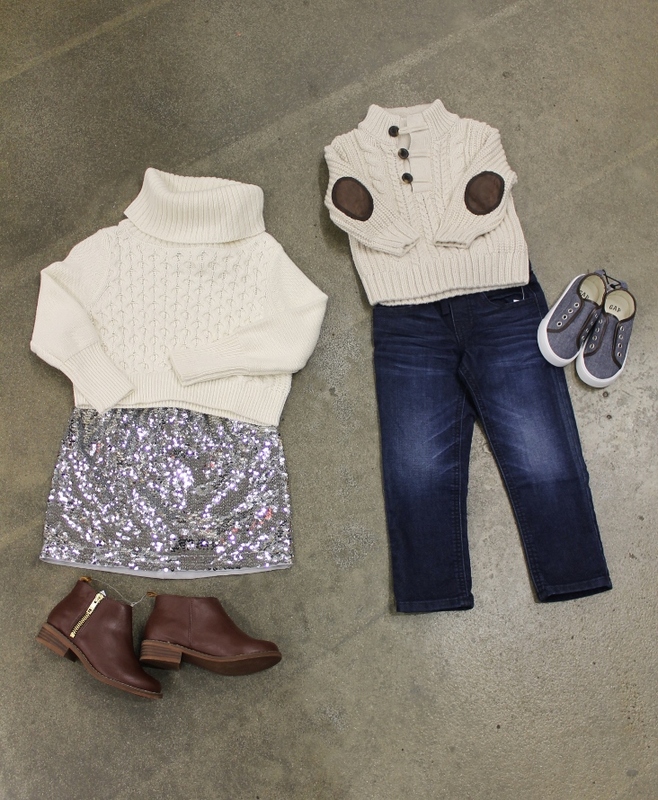 Sequin skirts and elbow patches for your mini me? Yes, please! I LOVE picking out outfits for my mom. And she loves it too so that she doesn't have to think about what to pair with what. Carolina Premium Outlets has A TON of stores to choose from, making it easy to put together a full look for her. These Ann Taylor glitter skinny jeans are perfect for her (psssst they come in a variety of shapes like Modern, Curvy and Petite so everyone can find their fit!) and versatile enough to carry her from season to season. All I needed to add was a sweater and some bling to round out the full look. She'll look SO cute in this all winter long! We all have that person who we feel like... what they heck are we going to get them? Enter my go-to gift: Yankee Candle! It's a great option because it's not too personal, but still says that you care about them and were thinking about them during this Holiday season. My advice? 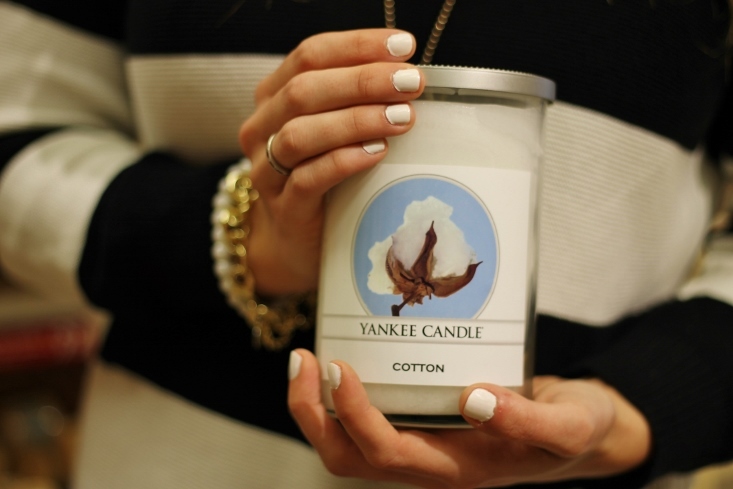 Stick with a classic scent, like Cotton. Right now, Yankee Candles at Carolina Premium Outlets large candles are on major sale so you can knock out a few gifts with one swoop. If you want to see more of my Holiday Gift Guide ideas, make sure you're following Carolina Premium Outlets on Facebook and Twitter! I'll be sharing my favorite items over the next few days and want to know what some of your favorite gift giving tips are! 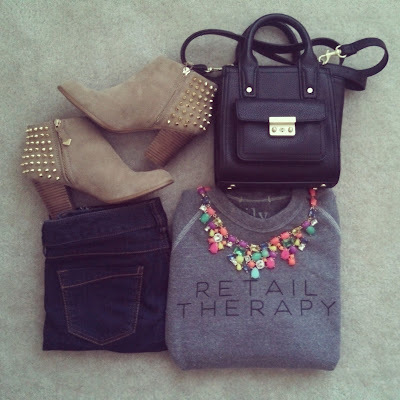 It may be Monday, but it's time for some RETAIL THERAPY and shop, shop, shop! Cyber Monday deals are here and you don't want to miss these promo codes. So whether you're shopping for holiday gifts or a little something for yourself, you'll save BIG! Also check out my below list of Small Businesses that are celebrating Cyber Monday too! Ready... Set.. GO! Amazon.com – Use code 30BLACKFRIDAY to get 30% off select clothing , shoes, accessories, jewelry, and watches. GiGi New York - Save up to 35% on your order! Lilly Pulizter - Deals dropped every hour, on the hour. Nordstrom – up to 50% off select items + free shipping and returns. October has been so amazing! There's a reason this is my favorite time of the year. The crisp air. The temperature cool down. Football. The fair. Halloween! Eeeeek! But that also means it's been a crazy packed month. I decided to do a little round up of a few outfits that don't always get to make it on the blog... Here's a peek into my instagram diary for April. Nothing better than a good ol' plaid blanket scarf, right? How cute is this Adam Levine Collection dress? It's on sale and oh-so-cute! I'm all about suede and corduroy this fall season. LOVE it! 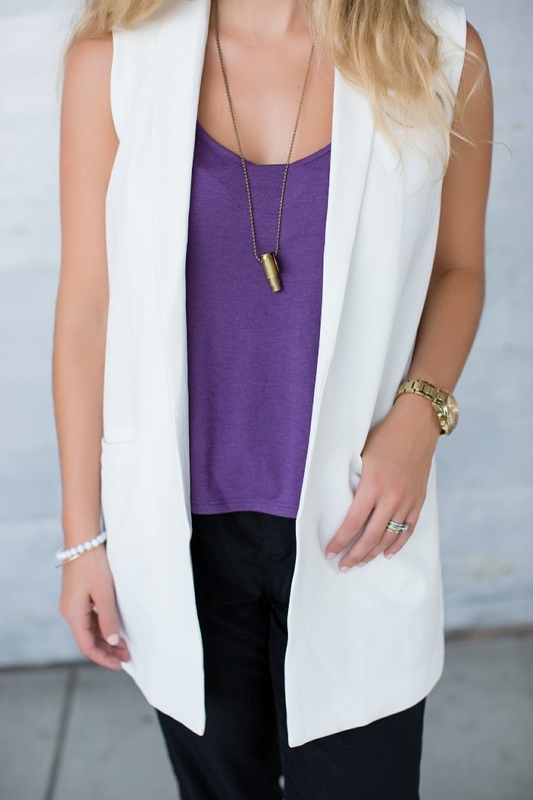 Ever since I received this white sleeveless long blazer, I've been racking my brain on how I can wear it throughout the seasons. I thought why not share about how I'd wear it now, and then still be able to wear it later, as the temperatures really drop. We're still going to be in the upper 70's later this week and this is a perfect counterpart to that awkward weather limbo season. It's the perfect look for the office that's still put together but fashion forward enough for me. Plus when I'm walking to get my lunch, I won't be sweating in fall sun. I LOVE the length of this blazer - it's super flattering on. I'm thinking I'll wear it next with some skinny jeans and a blouse once the thermometer starts to drop. How would you wear it? Any outfit ideas? I'm open! I love the brands we get to work with during this collab and this year we teamed up with The Mint Julep Boutique! They're got a ton of cute game day options, and even more just cute clothes! And even though we're going to be rivals this weekend, her outfit is SO cute. Make sure you hop on over there and take a peek! Sometimes, I get to be comfy casual when watching the Florida State games. And other times, it's Saturday! Which means we have an event or a party to go to after the 4th quarter (or sometimes during the game. Eeeek!) So this was one of those "glam game day" outfits where I got to wear it for the game, but guess what? It doubles as just a regular outfit too! After all, aren't those versatile outfits the best anyways? I'm REALLY into the suede look right now. It's so lush. This shift dress is so incredibly comfortable. 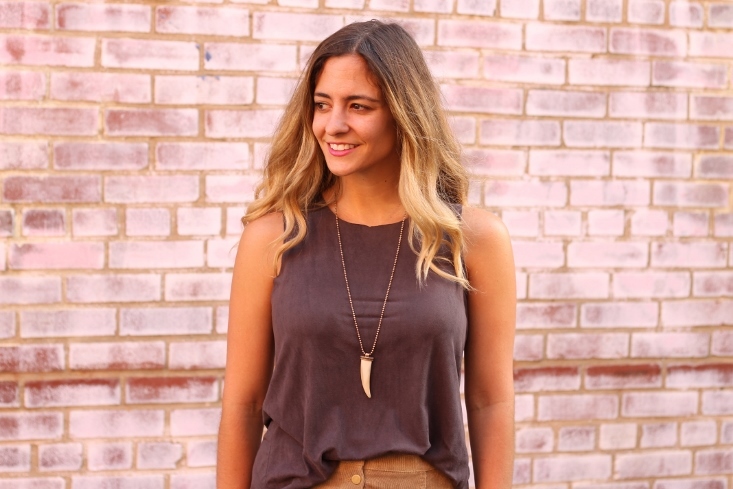 I love the details on it like the suede-like material, laser cut out hem, and pockets! Plus, the fact that it's garnet/burgundy/oxblood/wine/whatever you want to call this color, it's probably going to get lots of use as we head into the Holiday season. Can't believe it's almost that time of year already! 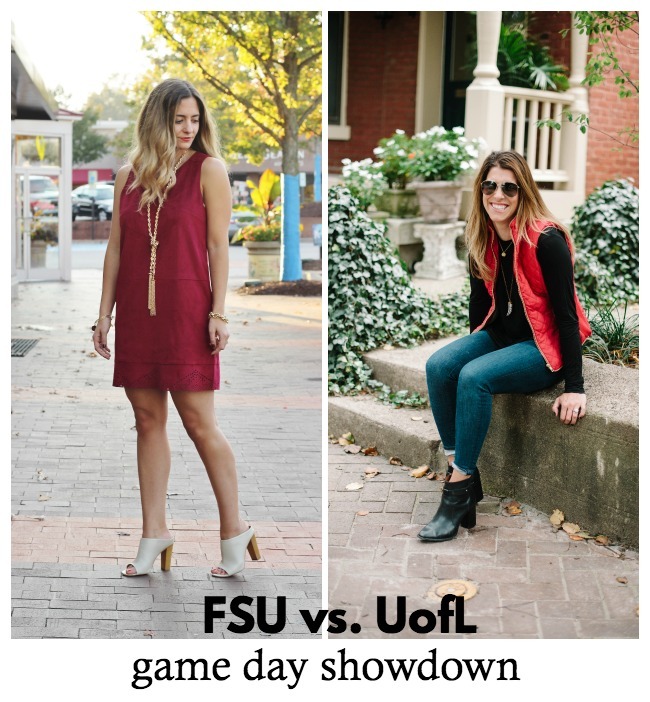 Don't forget to check out Danielle's Louisville Cardinals game day outfit (gimme that vest and those booties!) She's the best! Happy TGIF you guys! You guys... 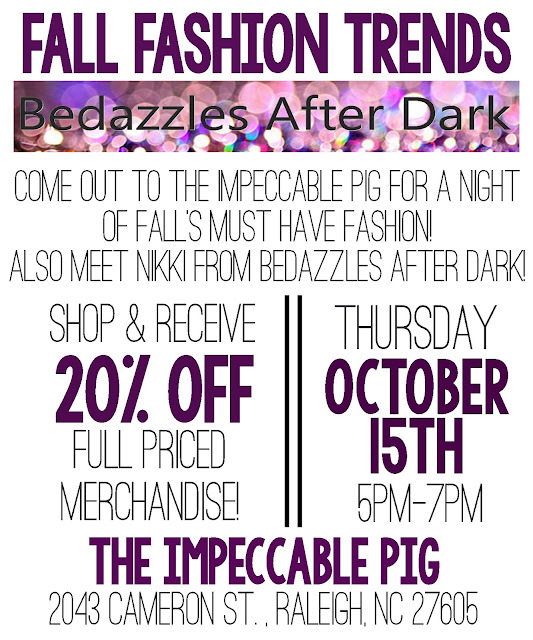 I'm SO excited for my event happening Thursday at The Impeccable Pig's Cameron Village location. I stopped in there last night (where I picked up this little ensemble!) and there are so many amazing fall pieces! I hope you'll be joining us from 5-7 pm where you'll be able to get 20% full priced items! How fantastic are these two pieces? Literally the second the manager Allison showed them to me, I was like "I have to HAVE these!" Together, they're absolutely perfect for this transitional time. You know the awkward it's still cool in the mornings, but warm in afternoon days. I love how edgy they look when paired with the moto buckle boots. But I'll still be able to wear them well into the fall/winter months. That skirt will look great with a pair of tights and brown riding boots. And the tank I can rock with jeans, a blazer and booties. Plus, they can both still carry me through the spring months too. 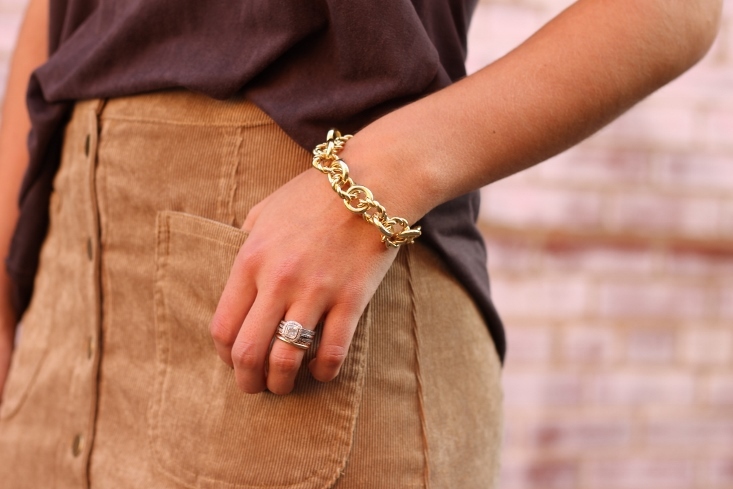 Got to love versatile pieces! I really hope you'll be able to make it out on Thursday. I'd love to see you there! It's going to be so much fun. Let's go shopping! !